The Brit and I ventured out again into new territory; brunch at The Napa Valley Bistro. We were on our way to a release party at Frog’s Leap, so we thought we would go and line our tummies before partaking of the grape. 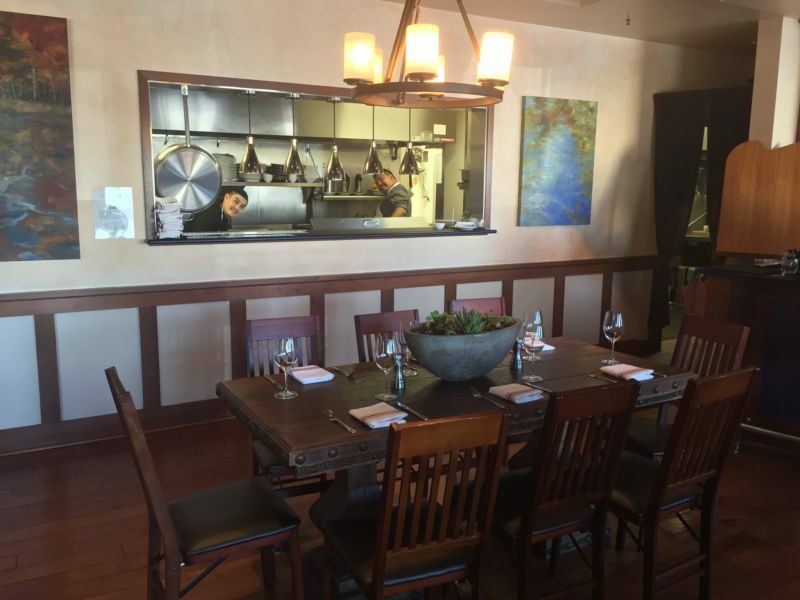 The Napa Valley Bistro is at the end of Napa town center right off of Main Street on Clinton. 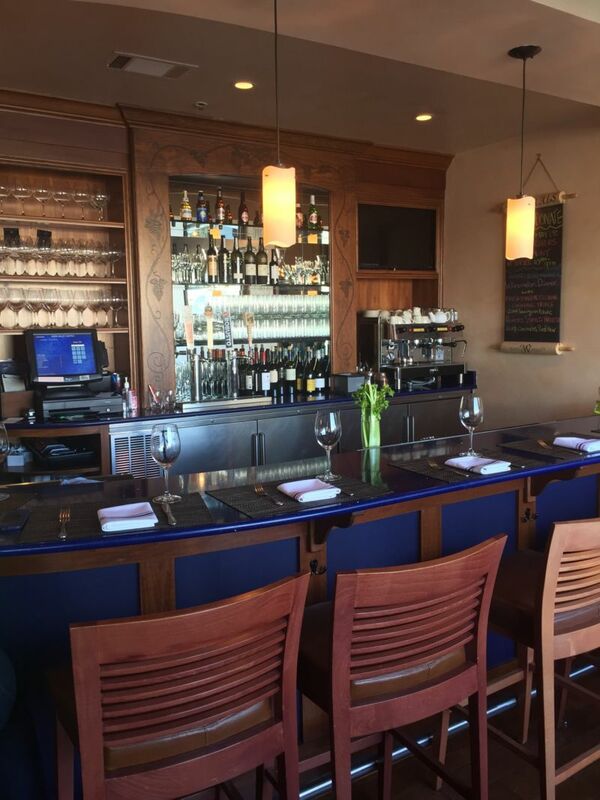 There are several other excellent restaurants in the area. This restaurant has no dedicated parking lot, and finding parking on the street can be a challenge during busy times so be aware. 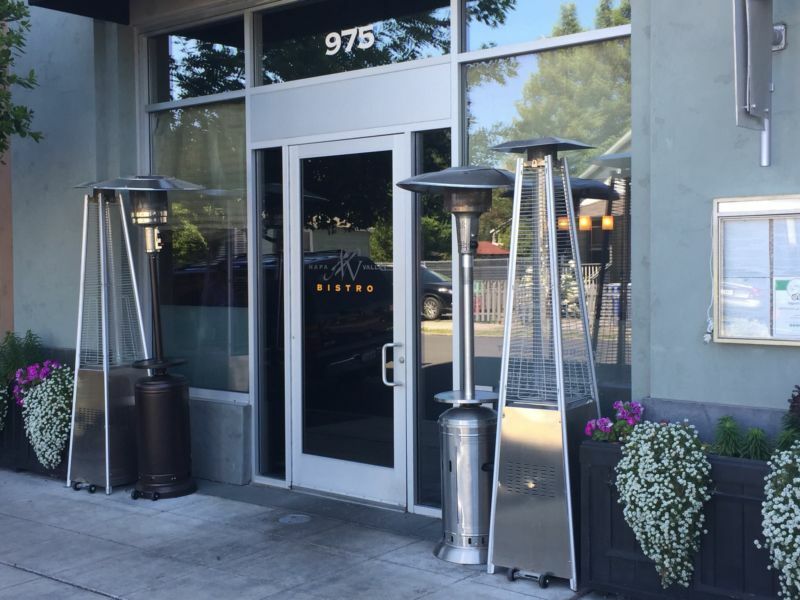 The outside of the restaurant has a couple of little bistro tables. It was a gorgeous day and I wish we would have thought to sit outside. However, the inside of the restaurant is lovely; very classic warm styling. I loved the artwork and the feel of the place. There is a bar to one side and a very open restaurant to the other. The chefs noticed as I was taking photos of the restaurant. They had cute personalities and photobombed the pictures with great big smiles. It made me grin too and gave me even warmer feelings about the place. The wait staff was extremely friendly, efficient, and knowledgeable. I thought she did a great job. She described the dishes and the specials well and was very attentive to our table. We each ordered a drink. 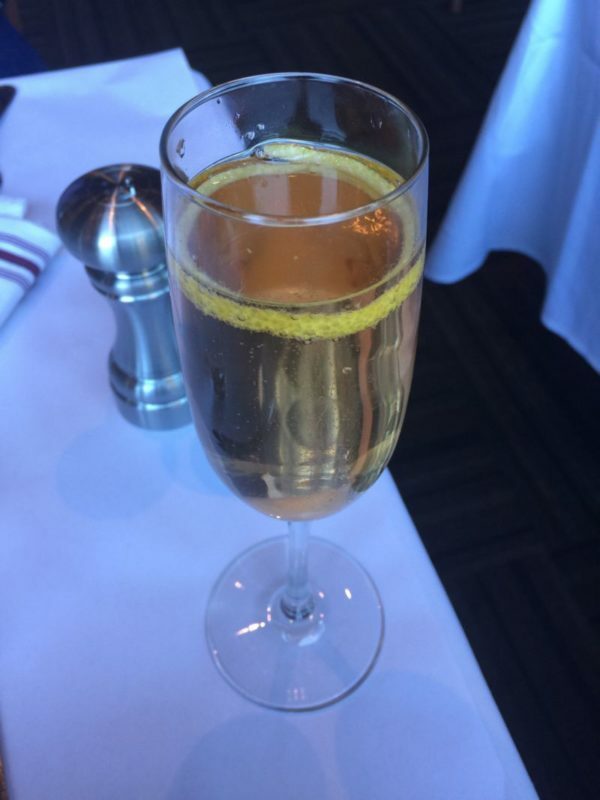 None of the wines appealed to me, so I ordered a glass of sparkling wine from Domaine Carneros which is always a favorite of mine. The Brit ordered a champagne cocktail. I could have kicked myself, because his drink was exquisite. We were both impressed with both its flavor and its beautiful presentation. I am sure The Brit will steal their idea of a lemon rind ribbon in the glass. The Brit Comments: This champagne cocktail differed from the traditional recipe in several ways; it used loose sugar and not a cube, it had no brandy, and used a lemon twist and not a cherry. The result was excellent. The lemon twist floated on top of the drink, wrapped tight inside the glass. The lemon added a citrus bite that amplified the impact of the Angostura Bitters. I suspect it may take plenty of practice to reproduce this drink, but I shall persevere and report back here. The Brit and I both commented on the music in the background. They were playing Doris Day and Frank Sinatra at the perfect level. It was nice to hear such great old style music while we dined. We then got to the business of ordering our meals. 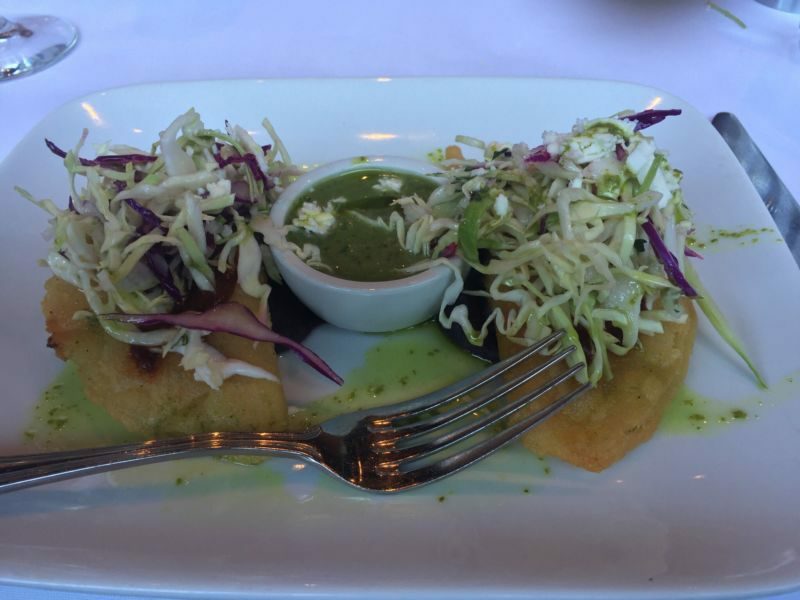 We decided on small plates to share so we could try out several things on the menu. 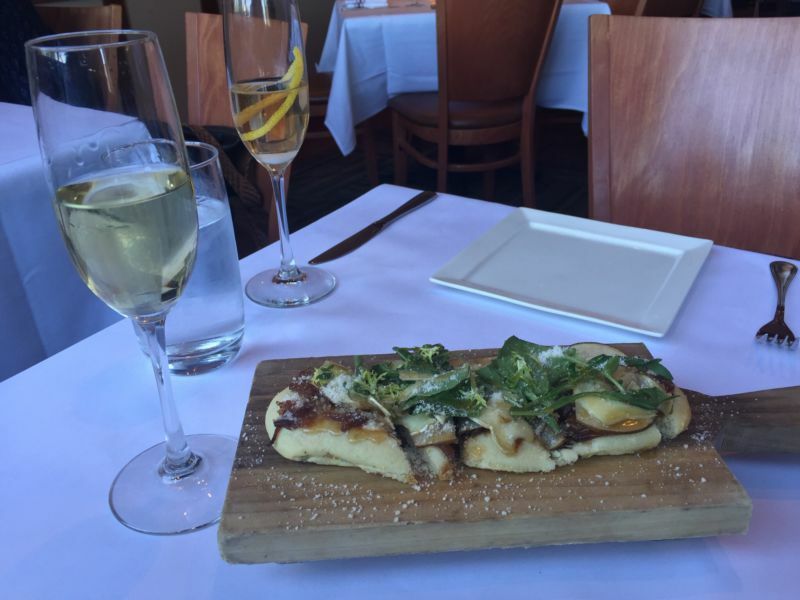 We ordered the flatbread as a starter to share, empanadas as my main meal, and The Brit ordered the calamari. The flatbread came and it was beautiful to look at. The pears, brie, and honey were a great combination with the soft pizza dough crust. I was wishing that there was some prosciutto on it for a bit of saltiness and dimension. That would have brought the taste over the top for me and would have made the dish outstanding. The Brit Comments: My thought was that a pinch or two of salt would help the taste, but California Girl shows why she is the chef with her better suggestion of prosciutto. Then came my empanadas. These were good, but again, there was the X-factor missing to make them great. They were filled with chicken, but the chicken didn’t have any wow factor in the flavor. I think they were relying on the green sauce that was served with it to give it a bit of flavor and interest. That was good, but again to make this dish great, the interior filling could have been done in a more flavorful way. The cabbage on the dish added crunch and a little texture, but it just missed out on Yumm. The Brit’s Calamari was a really nice big plate. They were battered in what tasted like a light buttermilk tempura style batter with nice pepper seasoning. 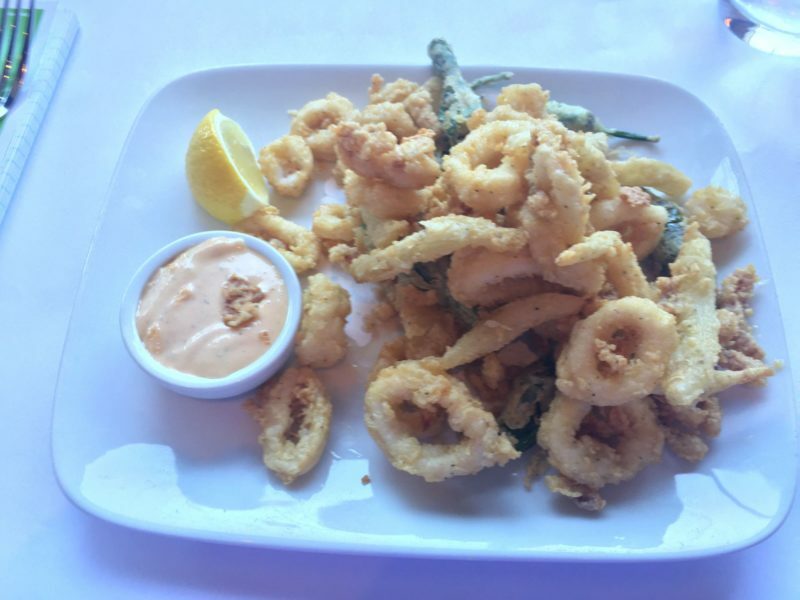 I really liked the cook of the calamari and the texture they achieved. I also like that they battered some mild shishido peppers and fennel with the calamari to add interest and flavor. It tasted as though there were some sweet onions in there too. The thing that let this plate down was the ancho chili-Lime aioli. This just fell flat and didn’t add anything to the flavor. We ended up eating it plain which was fine, as it tasted great without the dipping sauce. As we had small plates and we were really enjoying the atmosphere of the restaurant, The Brit and I decided to order dessert. He ordered the Berry and Cabernet sorbet. I ordered the berry tart. 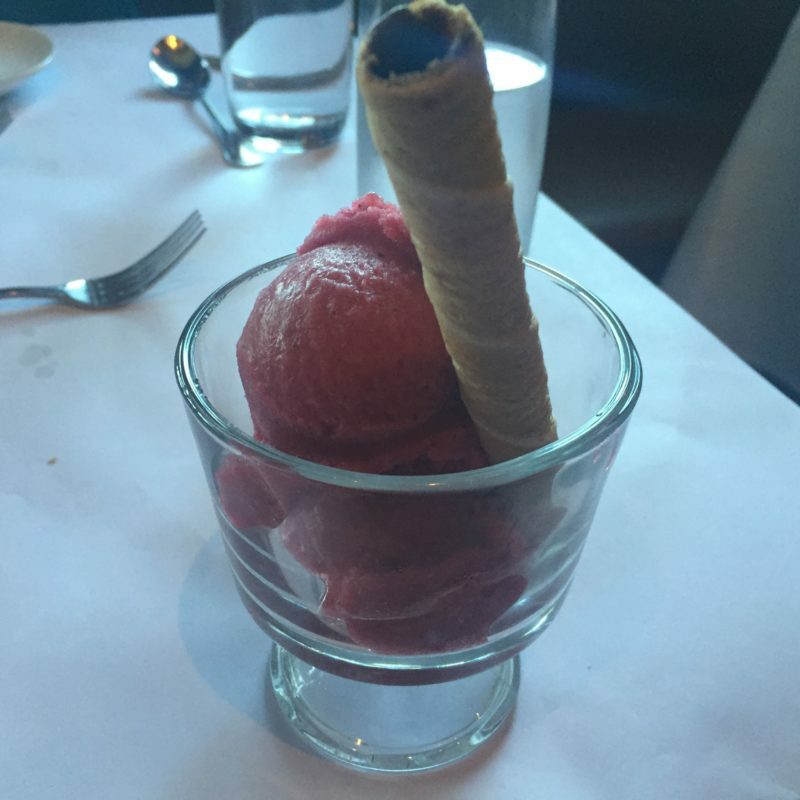 The Brit, ever the sorbet lover, raved about his choice. I tasted it, and for me it was far too sweet. I would have liked it to have more sharpness. But let’s be fair, I don’t eat much ice cream or sorbet, because I usually find it too sweet. It simply could be me. 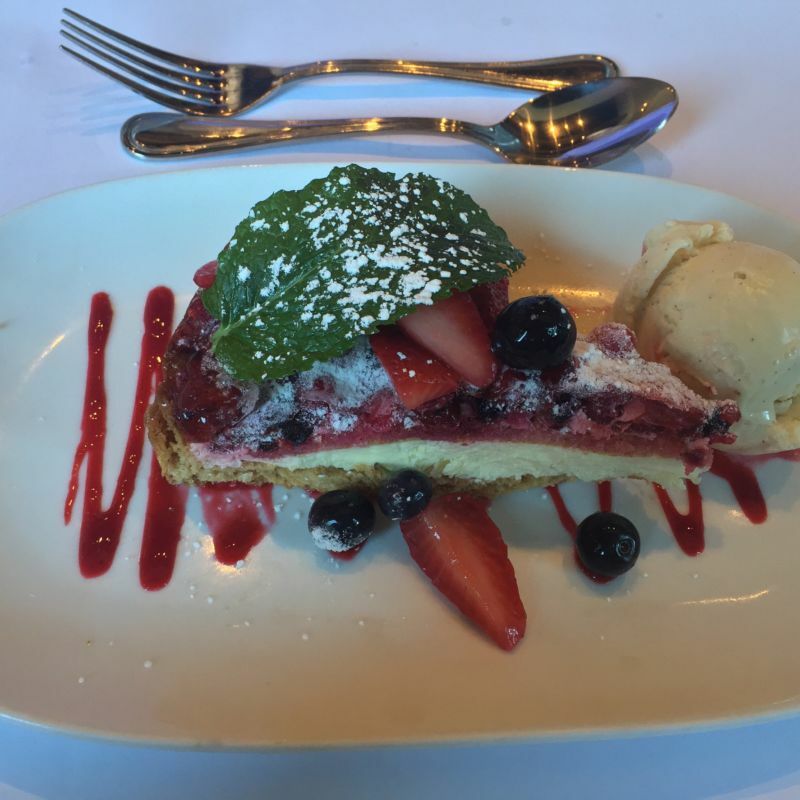 My berry tart was beautifully presented. Unfortunately, this dish fell flat for me. The base of the tart was bland and a little bit mushy. The Chantilly cream didn’t have enough flavor. I would have liked to see lemon or orange in the cream to brighten and lift the dish. The berries on top were a combination of cooked and fresh, but they just had no oomph! Overall our meal was good. The service and the staff were outstanding. The restaurant was beautiful. We really enjoyed it. 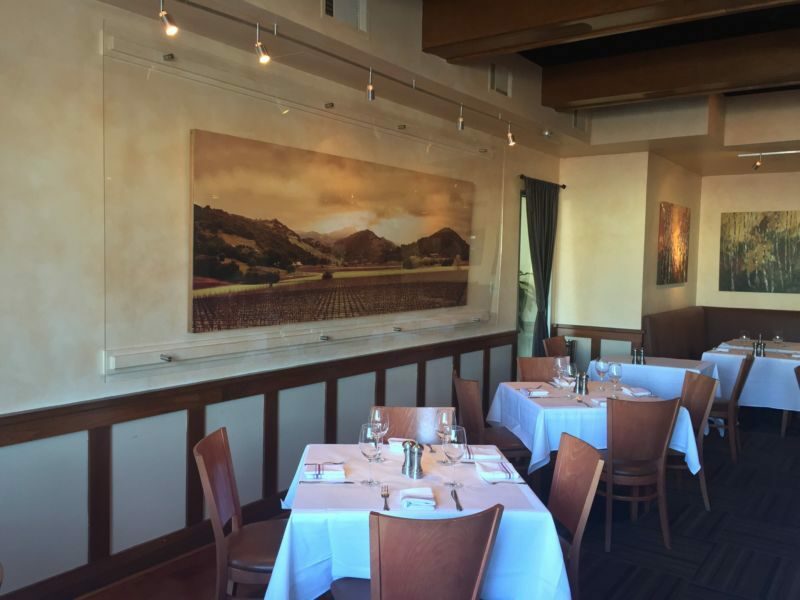 Would we eat at The Napa Valley Bistro again? The simple answer is yes, if for nothing else to have the amazing champagne cocktail, the nice ambiance, and the great service.